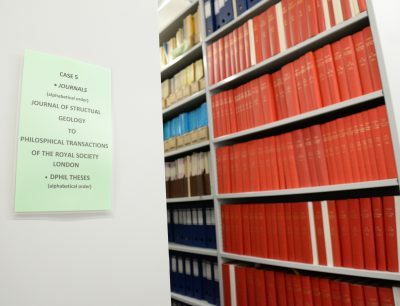 The library holds roughly 10,000 books relating to the teaching and research of the department. There are multiple copies of textbooks and new publications are added regularly. Contact the librarian if you have any recommendations or suggestions. A range of journals are held in hard copy by the library. Current subscriptions are in the main library, and those that are not currently under subscription are kept in the basement and can be fetched on request. Books kept in the Confined Cupboard must not be taken out of the library. Return the book to the librarian’s desk at the end of each day. Access to the basement is available on request. They are not catalogued on SOLO but they are listed – please ask the librarian for information and access. These are box files with articles provided by tutors. 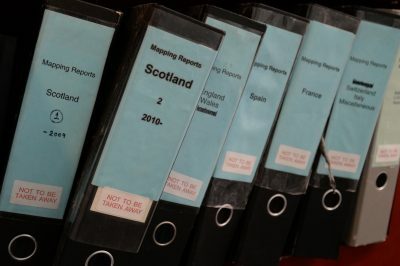 The files are arranged by year and by tutor. Do not take any of the articles out of the library and return boxes to shelf L-20 promptly. 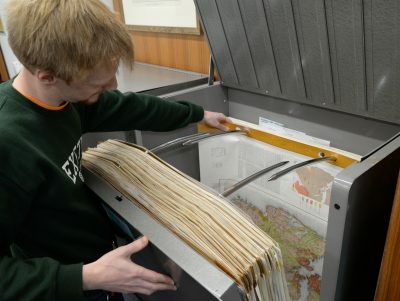 Reports written by previous students on their mapping areas are in files on shelf L-19. They are arranged by country, and include maps as well as practical information for planning your project. Copies 4th Year Projects are kept in the Confined Cupboard. There is a collection of reprints of articles written by members of the department kept in the basement. There is a card index for older material, and recent material is kept on racks in the Research Common Room. There is a good – if assorted – collection of material on the geology of countries throughout the world, some of which has not been catalogued. It is kept in the basement and can be accessed on request.